Mom has been telling me about Bandit, a six year old male cat available for adoption from Wayside Waifs in Kansas City. She says he's a very nice boy, but people just don't know about him because he's not in the Cat Adoption area at Wayside. He's not hidden away because he's been bad or anything-he's quite loving and playful actually! It's just that, well, Bandit likes to think of himself as the only cat. In the world. Ever. Bandit definitely needs to be a single cat in his new forever home. But with him, one cat is all you need! He'll be happy to snuggle with you or sit on your lap. He'll follow you around the house and keep you company. When you're ready for a good game of "Kitty Fishing" just bring out the wand toy and he'll be ready to chase it! If you're interested in meeting Bandit, just tell one of the nice people at Wayside that you want to meet him and that he's in the CAT room. Oh, and tell them Sebastian sent you! Adopt A Less Adoptable Pet Week: It's A Wrap! Well, pals, we've reached the end of Adopt A Less Adoptable Pet Week. I hope that you've kept up with all the posts here and over at Ryker's blog. We've covered a lot of issues that might make cats seem less adoptable, but hopefully we've given you lots of reasons to overlook those issues and see all the benefits to taking one of these kitties into your home. Remember, just because we blogged about these pets this week, doesn't mean that there aren't pets like these waiting for homes all year long. There will always be a homeless pet that's just a little different, but they will give just as much love as any other pet you adopt. They will be likely to linger in shelters, however. Give them another look when you're trying to decide who will be your next family member. If you're not sure if your shelter has one of these "less adoptable" pets, ask a volunteer or staff member if they have a hard to place pet. They will be more than happy to direct you to one of these animals and will tell you all the things that make him special. 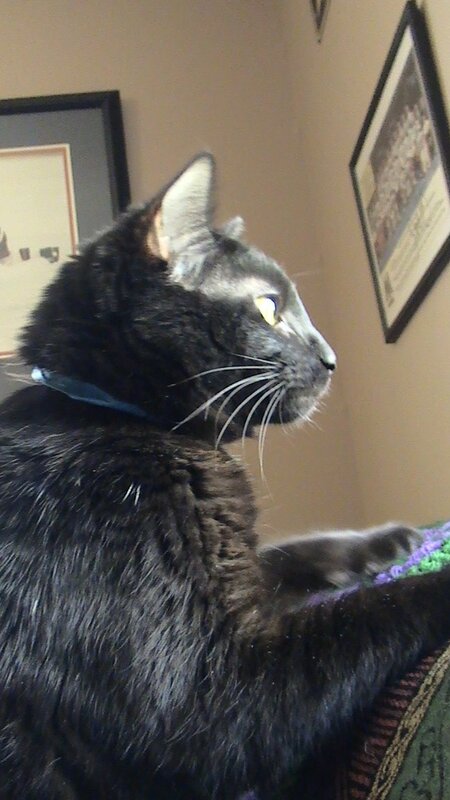 Today's guest blogger is Bonnie Still who leads the Feline Comfort Crew at Wayside Waifs in Kansas City. All the kitties tell her their special requests. She's going to share about Alex, who was adopted despite being "less-adoptable." For 1 week, I fostered a 10 month old kitten named Alex. 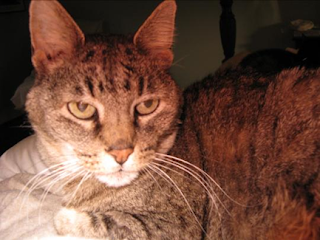 He had been surrendered to Wayside Waifs in Kansas City, Missouri because his owner had to move. Before I met Alex, one of the ladies I work with told me I would immediately fall in love with him, but did not mention anything “different” about him. Alex was in the C.A.T. room (Cats Awaiting Transition), one of the rooms new cats are housed until they are ready to move to the adoption floor. I walked in and said hello to all the cats, including Alex. I didn’t notice anything “different” about him, he was lying down watching everything. My co-worker had said Alex was fine to be let out into the room, so when it came time to clean his kennel, I opened the door, and out walked this shaky, wobbly, kitten. I then looked at his paperwork and saw that he had Cerebellar Hypoplasia aka Wobbly-Cat Syndrome. The vets told me Alex’s condition was mild. I had seen much younger kittens with CH at the shelter before, but this was the first time I’d seen an older cat/kitten. For some reason, this made me more emotional towards a cat than normal. Maybe it was because he wasn’t a stray that had been brought in, but someone had owned him, and gave him up. I watched Alex walking around the room. I realized he was wobbliest when he first came out of his kennel, but as he continued to move around, it lessened. I picked him up and snuggled right into me, purring and making biscuits (kneading with his paws). Yep, I fell in love completely. The following day, I found out that before Alex could move to the adoption floor, we had to know for certain that he could use his litterbox consistently. I offered to foster him, and within a few days, I was able to take him home with me. Alex did very well in my home, using the litterbox consistently and properly. He enjoyed snuggle time and play time. It was a new experience for me. I was used to allowing a cat to go wherever s/he wanted in our basement, but I couldn’t do that with Alex unless I was there to supervise him. He was not afraid or timid of anything, I was the one constantly worrying! Nothing stopped Alex. When he first saw the stairs, his eyes lit up. He was cautious at first, and then became so confident that I had to stop him before he would overdo it and possibly hurt himself – he was not happy with me for that. I had researched CH and found a fantastic yahoo group devoted to CH cats. http://pets.groups.yahoo.com/group/chkittyclub/ These cat owners are phenomenal! I was blown away by their passion for these cats, and the extremes they would go to for them to have a safe, comfortable, loving home. They offered so many wonderful tips. 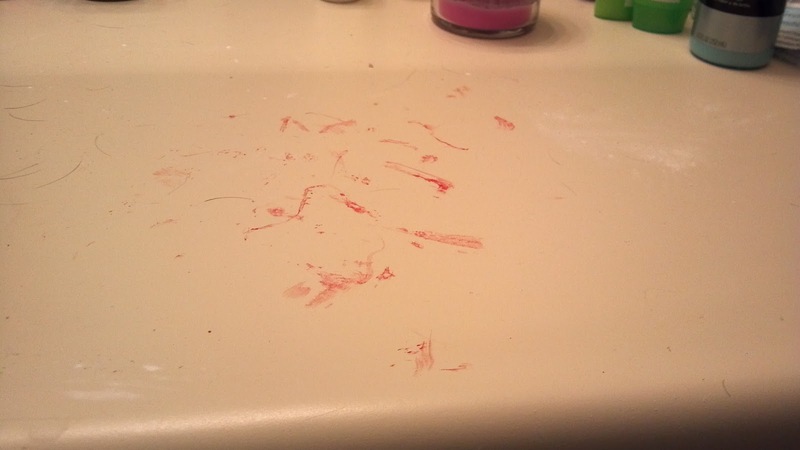 One of the most important ones I probably never would have thought of – CH cats can not have their nails trimmed short – they need them to pull themselves up onto furniture. Our last day together in my home, I brought him upstairs into our den. I watched him shakily reach up to look out the window, and then pull himself up onto the futon to curl up next to me for a nap. That is one of the sweetest fostering moments I have had and will always cherish. I love all the cats that I have fostered, but there is definitely a special place in my heart just for Alex. He taught me to not feel sorry for him, but to encourage and help him. I also learned it takes a special person to adopt a CH cat. Thank you Alex, for allowing me to be a small part of your life. Alex was adopted a few weeks after being fostered! Thank you, Ms. Bonnie for telling us about Alex and CH. I bet you miss him, but you helped him find his forever home by sharing yours with him for a week. CH kitties need a little more supervision, but an experienced cat owner could be a great match for a wobbly cat. Please consider these special kitties when looking for your next family member! Adopt A Less Adoptable Pet Week: Chronic "Cold & Flu"
Today's guest blogger is none other than Ryker's mom, Lisa Richman from A Tonk's Tail...er, Tale... and Mom's partner in crime at Wayside Waifs. She's going to share about Arnet, a kitty with calicivirus. 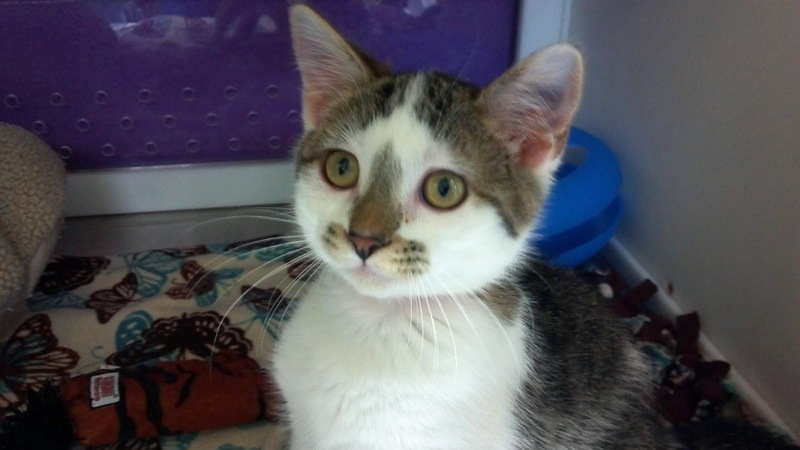 Meet Arnet, a 3 month old darling who’ll purr her way straight to your heart! Arnet was almost adopted a few days ago…until they learned she had just recovered from calicivirus. Don’t blame the adopters – this time. They have an older cat undergoing treatment for cancer. In their case, with an older cat who has a compromised immune system, it was the right thing to do. But most cats have healthy immune systems. And many cats have not only been exposed to calicivirus, they’ve been vaccinated against it as well. Responsible cat owners continue to vaccinate against it annually. Every feline wellness exam includes FVRCP, the core vaccine that inoculates kitties against both calici and FHV-1. And while it can’t guarantee your cat won’t ever catch the kitty flu, it’s a good way to ensure that any upper respiratory infection they come down with is much milder. Does this make Arnet less adoptable? Yes. Arnet taking a break from a play session. A responsible shelter has to provide full disclosure to any potential adopter, and that full disclosure includes the fact that a cat infected with calicivirus can become a lifelong carrier. And those are scary words to the uninformed. Here’s what those words don’t mean. They don’t mean a cat like Arnet is contagious all the time. In fact, barring any stress in this young lady’s life, it’s possible she’ll never show signs of calici again. Usually after the age of three these kinds of infections are mild or asymptomatic, according to one feline medical journal. However, things happen. A move to a new home. The introduction of a new pet – or a child – to the family. Disruption in routine. These stressers could cause Arnet’s calicivirus to flare up. If she were to get sick again, then it’s important that Arnet see a vet…for the same reasons you’d take your child to see a doctor if she came down with the flu. And just like the flu, calicivirus symptoms can include a runny, snotty nose, sneezing, lethargy, a fever, achy joints and disinterest in food. Like your child, you’ll want to push the liquids, make sure they stay warm and rested, and get plenty of good things to eat. Unlike your child, you can’t exactly tell a cat she needs to eat and drink more! Food doesn’t taste as flavorful when your nose is all stuffy whether you’re human or feline…so warming it a bit may help entice her to eat. I speak from experience. 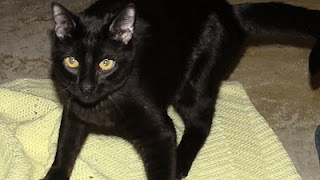 If you’ve read my blog on deaf cats at A Tonk’s Tail…err, Tale… then you’ve met Maxwell and heard about his early run-in with ear infections. What I didn’t mention in my blog was that poor Maxie also came down with calicivirus in the middle of it all! (Have you ever heard a snotty cat purr? *purr SKRANKKKK purr SKRANKKKK* Kinda noisy…) But today he’s hale & hearty, and my vet’s not a bit worried about our other cats contracting it. Bottom line: do what you can to educate potential adopters. Often it’s the unknown that’s the boogeyman in the closet. Shed a little light on medical conditions like calicivirus and FHV-1 and help adopters understand it’s not something they necessarily need to shy away from. I have great news! Arnet went to her forever home yesterday! She was adopted by a Wayside Waifs volunteer who has renamed her Cloe. What a lucky girl! There are other kitties out there like Arnet though. 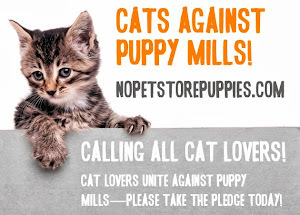 Make sure everyone knows that calicivirus doesn't have to be a reason to NOT adopt a cat. I welcome Michelle Cour as guest blogger once again. Hey there, Halley here! My name was formerly Luna because I had a crescent moon shaped patch of light fur on my dark fur. One of mom’s roommates used to call me Lunatic and unfortunately the name fit, so I had to get my attitude adjusted and stop being such a diva. I whined a lot at the shelter and wanted tons of attention from everyone, but nobody wanted me. I missed my family I had for 11 years and had to come to Wayside Waifs because my owner had to report for basic training. It would be fair to say I was rather cranky, and some people called me a diva. I’m Hannah (formerly Josie). I loved free time out of my kennel and I’d purr like crazy for anyone who took me out and gave me loving, but then I’d swat them when it was time to put me back. I didn’t get it that my behavior discouraged them from letting me out, which I loved. The worst was when I slapped a nice lady who fed and cared for me because I was mad she brought kittens to live next door to me. I wasn’t getting enough attention already, and kittens are huge competition for a scrawny 10 year old like me. I wasn’t very friendly and made little effort to meet adopters. Lots of people called me a holy terror. I’m mom. I adopted these two. They needed and deserved a home, and I knew their behavior was most likely due to the stress of living in the shelter so long, more than 6 months. 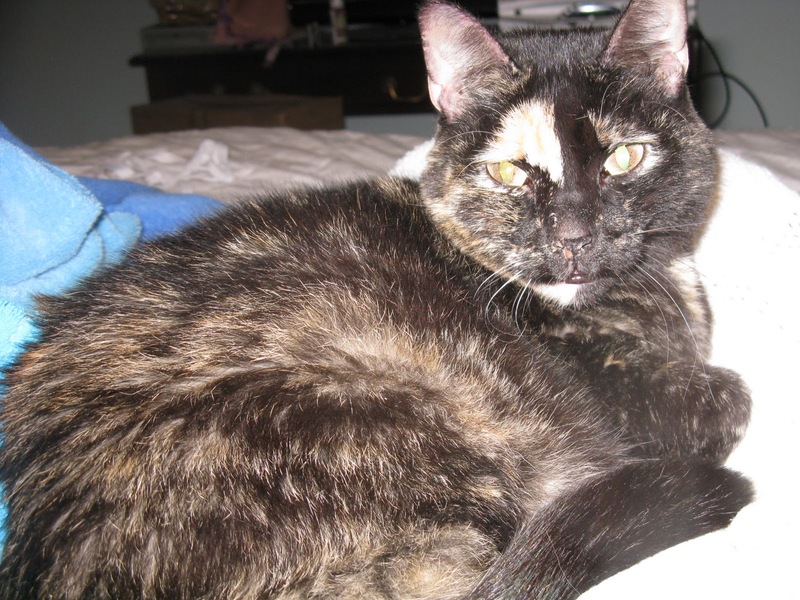 Halley was 11, a tortoiseshell which many people don’t find attractive, and black too; 3 strikes against her. Hannah also a senior was skinny and swatty. I’m an experienced cat owner so took a chance knowing life in a shelter can turn even the sweetest cat into a diva. Hannah has only swatted me once, more than a year ago. Halley whines far less often and learned to share my attention with Hannah and Harrison, my male cat. We’re all good! No happy ending so far for Annabella, who’s available for adoption at Wayside Waifs. She’s also 10 and wouldn’t have been given up but for the failing health of her owner. She’s an example of a cat who sometimes behaves like a diva, but actually is a very nice cat. She acts territorial about her kennel, (hey, it’s all she has left after losing her person and her home) so is particular about who can visit her at her kennel and how they interact. She also doesn’t like the Comfort Crew changing her litter or cleaning the kennel. She hangs out in the sunroom while they work and grouches if they put her back in her kennel. If they leave the door open, she goes back in on her own, especially if they leave a few dry treats for her. I’d encourage anyone who’s an experienced cat owner and open minded to consider Annabella. It’s tough on some cats, with different volunteers and adopters walking through all the time. It’s too busy and noisy a place for some, so they can begin to act out. When our “diva” cats go to their forever homes, we almost always get a note or email how the cat’s personality changed once they got in a stable quiet place with a person of their very own. And the adopters? So happy they chose them. I sure hope somebody adopts Annabella from Wayside Waifs very soon! Too much time in a shelter can make any cat a little grumpy, but once you get settled into your forever home, you start enjoying life a whole lot more! Once again, I welcome Kathryn Bloomer, volunteer at Wayside Waifs. She spoke with Jason, a diabetic kitty who went from a very sick kitty to thriving and enjoying life. Jason the Argonaut here. I'm one of those shelter cat success stories that you sometimes hear about. 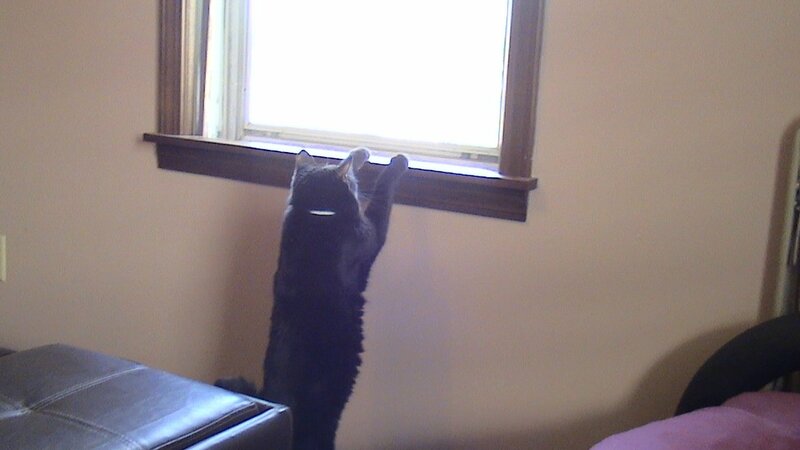 I came to Wayside Waifs as an elderly stray in September of 2010. I was very thin, very loving, but unfortunately I turned out to be diabetic. I had won the hearts of everyone who met me, and they were going to try to treat the diabetes, but bad turned to worse when my frequent upper respiratory infections became systemic. Not a good prognosis for a shelter kitty. Jason on his first night home with his foster mom, October 2010. Photo by Sarah Dieterle. I was pretty sick by then, but one of the vet clinic staff decided to foster me, to give me a good end of life experience. My life expectancy at that point was a couple of weeks. But, enterprising woman that she is, Sarah my foster mom decided to treat the diabetes and the systemic infection while she had me. First she tried several antibiotics to find one that worked for me. And, just like for human diabetes, my new mom learned how to give me insulin shots, how to test my blood sugar to make sure I was okay for the insulin shot, and how to track how the insulin was affecting my blood sugar. I even got to go on a diabetic friendly low-carb diet. You can't go wrong with high protein for a cat! And guess what. After about a month of insulin and antibiotics, I was doing a lot better. My URI symptoms resolved and my blood sugar began to reach more normal levels. Finally, I didn't even need the insulin any longer. I was officially an in-remission diabetic. Jason in May 2011. Photo by Sarah Dieterle. And here I am, a year later, still a kitty to be reckoned with. My foster mom officially adopted me last December. I was a calendar kitty for our 2011 calendar, and you can see from my photo how good I look now. Although I'm in remission, I still am, and always will be a diabetic, and there is always the possibility that I might go back on insulin at some point. But I just wanted to let you know that you CAN deal with us diabetic kitties. I may be old and sometimes bratty, but I'm a dearly loved miracle kitty. Thank you so much to my foster mom Sarah. Like her, maybe you, too, will someday make a difference in the life of a less adoptable shelter cat. Thanks Kathryn and Jason! 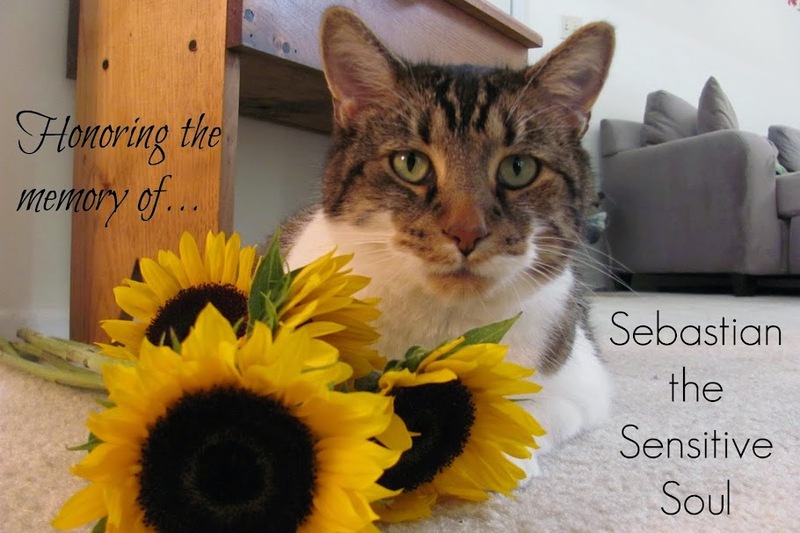 And special thanks to Jason's mom Sarah for making such a difference in the life of a shelter cat! Just because a cat has special health needs, it doesn't mean they should be overlooked at the shelter. Today's guest blogger is, once again, Michelle Cour. She spoke with Bombay, a three year old cat available for adoption from Wayside Waifs in Kansas City. Okay, I admit sometimes it’s hard to see details of our pretty faces clearly. A black nose no matter how cute doesn’t stand out very well against black fur. And unless our photographer takes us into a sunny room for our photo shoot, you really don’t see all the beautiful coppery brown tones in our fur and underfur. Gorgeous! You’d pay hundreds of dollars for highlights like this at the salon, ladies! So please, next time you’re shopping for a cat, please consider us. 10. You can always find your black cat in the snow. For Florida, easy to find on any light colored surface such as carpeting or the beach. 9. Black goes with everything and it’s a powerful color. It's true. You know it. We know it. You've got your black power suit, your little black dress, best black heels etc. 8. Black cats look like little panthers. Their regal breeding is very apparent under their sleek black coats. 7. A black cat will match any décor. You won't have to redecorate your house to coordinate with your cat. They go with gold brocade, white velvet, pink moiré etc. 6. Black is beautiful. There's deep auburn black, blue black, the black with tiny white highlights, sleek black, fluffy black, the black with bunny-soft fur, you get the idea. 5. Black is slimming. Hold a black cat on your lap and you look 10 pounds thinner. 4. Black cats have more fun. You only thought it was blondes that had more fun, look at their black roots. 3. Black cats try harder to make up for the image they somehow got of being scary or evil. We’re nothing like that. We go overboard to be as affectionate and loving as any fluffy white, pink-nosed bunny kitty could be. 2. Love knows no color! Black cats don’t care what color YOUR hair is! Turning grey or falling out? Fine with us. And the # 1 reason to adopt a black cat is that Black Cats are the least likely to get adopted! We need you. You seem like a really nice person reading about us, kind and open-minded. So come meet a few of us and take one or two home today. Otherwise, I’ll have to put an evil spell on you. Just kidding! Thanks Bombay and thanks again Michelle! So many great reasons to adopt a black cat. If you're not in the Kansas City area to give Bombay a forever home, there are always plenty of black cats to choose from in your area. Hi, I’m Jaguar and I’m a 12-year-old shelter cat. That makes me a senior cat, and it’s not easy being a senior shelter cat, because, well, seems like everyone wants a kitten. But we seniors have our attractions as well, the first being – we’re not kittens! No curtain climbing, no screaming banshee raids from room to room, no sudden ankle attacks – well, not usually. We senior cats know how to savor life one dignified step at a time. I can tell you from experience that shelter life isn’t easy for us seniors. For one thing, being a senior is a little like having a hangover 24/7. You know – everything hurts, you hate bright lights and loud noises, you’re a little cranky, the brain is a little fuzzy, you don’t want to have to learn anything new, you don’t move very fast, and most of all you just want to go home and go to bed. So we senior cats are usually to be found napping. We senior cats might act a little depressed here at the shelter, missing the old life maybe. And if we look a little scruffy, well, sometimes it’s hard to get excited about grooming when surrounded by a new environment, new faces, and the occasional noisy visitor who likes to poke us to see if we’ll respond. Just ask my friend Annabella about the visitor who kept poking at her just to see her slap at him. “Oh, I like to box with cats – they enjoy it!” the guy said. Grrrr. Is it any wonder that we get a little swatty sometimes? But just because we might get a little grouchy at the shelter doesn’t mean we will stay that way. I mean, you get cranky at work sometimes don’t you? And then you like to go home to the cozy sanctuary of your home? It’s like that for us, too. We just want to go to a quiet, cozy home, where we can nuzzle you in peace, climb into your lap, and give you the loving that you deserve. Then we will blossom. We will get a new spring in our step, take extra care in our grooming and probably look and act years younger. I’ve heard some visitors say that older cats don’t bond as well to new people. Excuse me? I don’t know about you, but when I meet that special someone, I don’t care how old I am, I’m gonna love on them like crazy – make up for lost time, you know? It takes a special person to adopt a senior cat. I may not have as many years left as the younger cats, but we indoor cats have pretty long life spans – 16, 18, maybe 22 or 23. And then after I’m gone, that will make room for another sweet kitty in your life. How will you know that I’m the senior kitty for you? Just come and visit me. I’ll look up into your eyes, and you’ll know…you’ll know. Thank you Kathryn and Jaguar! I can understand where Jaguar is coming from. When Mom adopted me I was 7 years old. Not elderly, but certainly not a kitten. She saw the benefits of adopting an older cat and we have lived in harmony ever since! Today's guest blogger is Michelle Cour, one of the dedicated volunteers at Wayside Waifs in Kansas City. Michelle is known for getting the inside scoop from the Wayside kitties. She spoke with Snowflake, a two year old male, domestic shorthair, FIV+ cat available for adoption, and has relayed his story for me. My name is Snowflake and I’ll bet you can guess why if you look at my photo. Yep, all white with beautiful blue eyes, very soulful people say. I’ve had kind of a hard life living on the streets getting bitten by another stray, and having to find food where I could. Things are better now with regular meals, medical care and nice people to talk to and play with me. But I could really use a permanent home. The one challenge to quickly finding me a family is that I’m FIV positive. Don't be a scaredy cat! Many people don’t understand it and are afraid, so let me explain a little. It’s not a death sentence for me and doesn’t require expensive meds to keep it under control as is often needed with the human form, HIV. Feline Immunodeficiency Virus is an active viral infection causing an increased susceptibility to other infections. I can live a long healthy life if you take me to the vet if I develop an infection, like respiratory or urinary tract, easily curable with low cost antibiotics. FIV isn’t communicable to dogs or humans; only to other cats through bites, not through sharing food or water dishes. If you would like a cat and have none, I’d be a super sweet and special friend, so come meet me today! In fact, why not take me and one of the other FIV positive cats too? Two is always more fun than one. Also, cats who test positive can develop neutralizing antibodies and clear the infection. Yep, it's true, so I should be retested about 3 months after the initial test that confirmed my FIV positive diagnosis. I might be just fine. Please come meet me. You won’t regret it and you’ll be my hero forever. Thank you Michelle and Snowflake! I hope they cleared up any confusion about FIV+ cats and their adoptability. If we get information out about FIV, more people would probably adopt cats like Snowflake. This is the first in a series. You can read Post #2 here. It's that time of year again! Petfinder has designated September 17-25 "Adopt A Less Adoptable Pet Week." What makes a pet "less adoptable"? There could be many factors: special needs, blindness/deafness, FIV+, black coats, or advanced age. Sometimes, these pets linger in the shelter, waiting for the right family to come along and adopt them. This week, I'm going to turn my blog over to some guest bloggers to help spotlight some different pets who are, for one reason or another, less adoptable. I'm teaming up with my pals over at A Tonk's Tail...err, Tale... and together we'll share the stories of pets who, on the surface, might not seem very adoptable, but once you get to know them, you will learn that they make great additions to the family. Also, as a look back, you can check out my posts from last year's Adopt A Less Adoptable Pet Week. Last year I posted about both cats and dogs, but this year I will focus on cats because, well, there are a lot of "less adoptable" cats to talk about! You probably have a few "less adoptable" cats at your local shelter, too, so be sure to give them a second look if you're thinking about adopting. I had been surrendered by my family to a Kansas City area shelter. They said I was an "attention hog". They said I was jealous of the other cats in the house. They said the recent move upset me. I was lonely and sad living in the hug room at the shelter. The volunteers were very kind to me though. One in particular, named Cat, loved me a lot and was thinking about adopting me. Another volunteer had the same thoughts. That volunteer came back the day after we first met and told me she was taking me home with her! That volunteer is now my Mom. I felt a little bad, because Cat was so nice, but things have worked out beautifully. See, Mom needed me as much as I needed her. She was living in a new city and was all alone. She didn't have any friends or family nearby. She works from home, so she didn't even have any coworkers to talk to. She was lonely and sad living in her little apartment. When I moved in, we took away the loneliness for each other. She let me start my Twitter account and my blog. We started meeting people and anipals online. A lot of those online friends have turned into real life friends. Mom lets me know everyday that I am loved and I do the same for her. Life is much brighter for both of us now. These days, Mom and I blog about adopting pets. It's more than giving a homeless pet a home. Sometimes it can really turn someone's life around. It did for Mom...and for me. This is Butter. He is 4 months old and cute as can be. That's the problem. If he doesn't get adopted VERY SOON Mom is going to bring him home. He's the kind of cat she always talks about. She seems to think that orange striped cats are cool. She's also fascinated by polydactyl cats. Guess what? Yup. Butter has thumbs. Thank goodness he doesn't have freckles on his nose; he would have moved in last night. So please, help me out here. Get Butter adopted quickly. I'm sure tons of families would love a 4 month old, male, polydactyl, orange tabby kitten. Get him out of Wayside before Mom does something silly and adopts him. I'm an only kitty type of guy. I can't share my Mom with Butter-I can barely share her with Dad! Mom and Dad are going to the zoo today. In order to save money, they take a little picnic with them. Since Mom made tuna salad for the sandwiches, that means that I got the tuna juice! Having the tuna juice almost makes up for the fact that Mom and Dad are going to leave me by myself for a while today. Almost. Last month I posted about some gifts Mom took to the kitties at Wayside. Those toys came from Big Apple Pet Supply @BigApplePet and Steven Spitz aka @veganpetman. Because Mr. Spitz is such a cool guy and he knew I wasn't going to get to play with the toys, he threw in a little something for me! He sent me a self groomer made by CatIt. It comes with the frame that attaches to any flat or corner surface (Mom picked a corner for mine), plastic bristles, sticky mounting strips and my favorite part of all, CATNIP! Mom put it all together (with my help-that catnip smelled soooo good!) and put it on a corner between the dining room and the kitchen where I already like to rub up against the wall. There weren't many directions, but after looking at it for a little bit, she figured out where the nip was supposed to go and the best place to put a couple of mounting strips. Let me tell you, this thing is great! I like to be groomed by Dad, but with my CatIt Self Groomer, I can get that feeling anytime I want. I love to rub my cheeks up against it and walk against it when I go into the kitchen. Check out all the hair in the bristles! That's after having it up less than two weeks! The CatIt Self Groomer is a really neat product. It's fairly easy to put together and mount. I love to use it and it helps get loose hair out of my coat. It doesn't take up much space and can be put in a number of places. I don't know how easy it's going to come off the wall though or if it will come off cleanly. I guess we'll find that out when it comes time to move. All in all, I (and Mom) would recommend this nifty grooming tool! Disclosure: I received this product at no cost from Big Apple Pet Supply. All opinions expressed in this post about the product are my honest and true feelings about the product. The fact that I received the product for free did not influence my review. 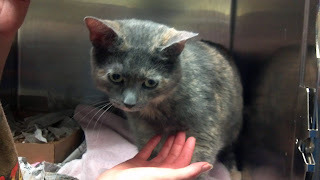 This week's featured furry is a sad little kitty named October. 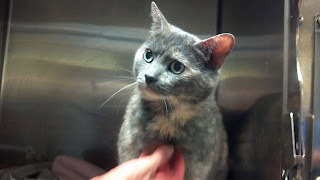 She is a 7 year old, domestic shorthair, dilute tortie. She has the saddest eyes I've ever seen on a kitty cat. Poor October is sad because her family left her at Wayside Waifs as the result of a divorce. Unfortunately, that's something that people don't plan for and they really should. They work out custody arrangements for children, but pets very often are surrendered to shelters. October is still in the back at Wayside and isn't on the website yet, but she should be available for adoption very soon. When she is, she will make a great addition to a family. She loves to be petted and really needs the attention. Please send nice thoughts to October to make her time at Wayside Waifs short so she can move on and mend her broken heart.